Enjoy your vacation on the gulf of Mexico, this great villa on the golf course has 4 bedrooms, 2 bath and a great view from the privat pool. 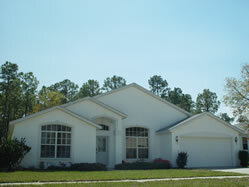 Just off the Fairway is this relaxing four bedroom, two bathroom home. With it's cool and relaxing colour scheme there is space to unwind and relax. Beautiful villa for 8 on golf course with private pool to enjoy.